Indium Corporation’s Greg Evans (center) is joined by Young-Rib Yoon, chief marketing officer for South Korea (left), and Pang Weng Fai, managing director for Asia-Pacific Operations in Singapore (right). 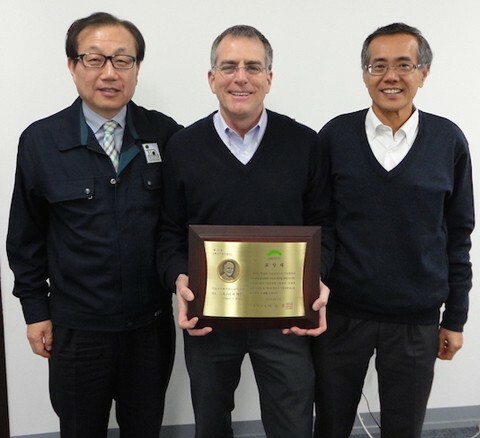 Indium Corporation's President and COO, Greg Evans, was recently presented with the 2014 Cheongju City Businessman Award in Cheongju, South Korea. The award was presented by the Mayor of Cheongju City. Evans was selected for the award due to the outstanding performance of Indium Corporation's Cheongju facility, and subsequent contributions to, and support of, the Cheongju City economy. Indium Corporation's Cheongju facility is extremely valuable to the indium and indium-tin oxide (ITO) market as it is a very efficient and fast recycler and refiner of indium metal. The facility's mature process enables the large and rapidly-growing LCD and display markets by helping assure the constant availability of the highest quality raw materials. Evans earned his associate degree in engineering science from MVCC before receiving his bachelor's degree in chemical engineering from Clarkson University and his MBA from Rensselaer Polytechnic Institute. Evans joined Indium Corporation in 1981. He was appointed COO in 1992 and President in 1997. Under his leadership, Indium Corporation has expanded into new markets, including thermal interface materials, solar assembly and thin-film, semiconductor packaging, and more. Indium Corporation's ventures into these industries have spawned new products, many of which have earned recognition for technical vision and innovation, including several prestigious Frost & Sullivan awards. Evans is actively involved in the electronics assembly industry. He is a long-time member and former president of the Surface Mount Technology Association, an international organization for electronics assembly.